What you see is what you get. 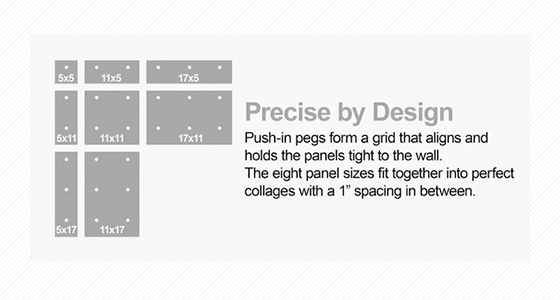 Supported by a grid of push-in pegs, Collagewall panels hang aligned and stay level. Installation is fast and fool-proof. Add, remove and rearrange pictures in seconds. 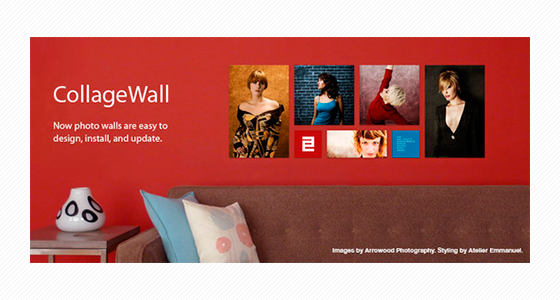 Collagewall is a easy-to-use photo collage display system that produces beautiful results. 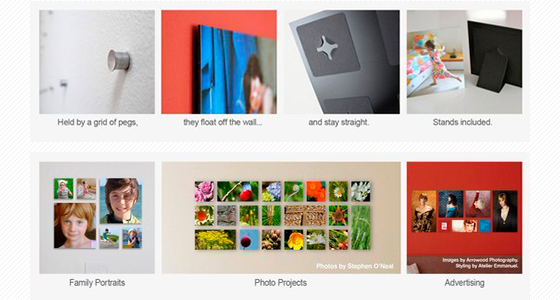 In our online ordering program, you simply upload the photos you want to include in your displays, then drag-and-drop them into one of the Collagewall Display templates, or design your own template. Don's Photo prints and mounts your photos, which are provided to you with all the tools required to make installation a cinch. Family photo walls are just one of many ways customers are using the system. Companies borrow photos and logos from their brochures for lobby displays, newlyweds make collages to celebrate their weddings, travel enthusiasts show off their latest adventures, others decorate with their photo projects and hobbies. Prints hang aligned and stay level. No more need to straighten pictures. Installation is fast and fool proof. Add, remove, and rearrange pictures in seconds. Whether it's family, travel, pets, objects, food, whatever you love. Create a unique story board that tells everyone exactly who you are.